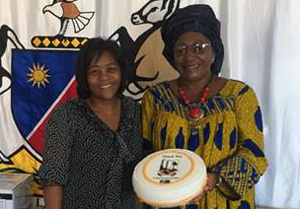 CakesforNamibia owned by Jacky Coetzee is one of the recipients of an income generation grand, valued at N$42,136 from Khomas Regional Council, consisting of equipment which will be used to boost her baking initiative. Jacky a previously disadvantaged woman is a small and medium entrepreneur owner operating in Windhoek and has been in the baking industry for 17 years, baking and selling custom decorated cakes in the domestic market. She has developed and grown her business by branching out into creating and marketing a number of dried cake mixes with detailed instructions, which are sold to customers who want to bake the cakes for themselves, but may not have time to start from scratch and she also provides training for baking and decorating cakes. Jacky said she is thankful for the grant and she and her team look forward to making an even bigger impact in the community through increased capacity brought about by the equipment. “We will report back to the Khomas Regional Council, with all the successes that this grant will allow us to achieve,” she added. 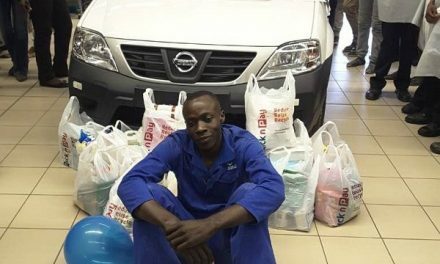 Jacky’s Bakery also sources dates which are grown in the south to support the use of local products in the production process, making the company a member of Team Namibia, therefore regularly donating to institutions such as old age homes and kindergartens in the Windhoek Constituency. Goods from the bakery are sold at the Grove Mall Spar and other retail outlets have also been approached. The Khomas Regional Council, supports companies and individuals that they believe can and will make a difference in the community and through the grants help those that help themselves, therefore making Jacky’s Bakery a perfect example of the type of self starting small enterprise that empowers individuals and communities. DBN to participate at the Erongo Expo.